Cardno is a professional infrastructure and environmental services company. At the time of the 2014 12d conference, Cardno employed over 8000 people across 85 difference countries with an annual revenue of over $1.2 billion. They are one of the leading providers in physical and social infrastructure and environmental services. 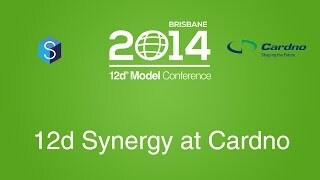 Dion Mead provided an overview of Cardno’s implementation of 12d Synergy at the 12d Conference in 2014. Attendees were guided through the full implementation of the system from research and development, testing right through to a complete roll out across Cardno New Zealand. Dion also reviews how the team are using 12d Synergy. Cardno has adopted 12d Synergy as a data management and project collaboration tool and this video provides an overview of Cardno's adoption and use of the product. Dion was a frustrated project manager. He could see a need for improvements in their existing data management, particularly filing project data, documentation and managing emails. At the time of implementation Cardno had not even considered 12d Synergy’s integration with 12d Model, it was purely a Quality Assurance Solution. They were looking to implement a system which would assist them with their ISO 9001 Quality Assurance audit. Cardno had a list of features they needed when they went to search the market. They wanted to ensure that they could track emails, provide a paper trail of information being received and issued. The system also needed to be able to search for information efficiently, provide a platform to encourage collaboration and be simple to use and integrate across all disciplines of the business. Thanks to the range of features, 12d Synergy provided Cardno with everything they needed from Data Management, Document Management, Project Templates, Email Management, and more.